Please take a moment to share your Scorgies memories. You’re welcome to post articles, pictures, posters and videos here. Click here to register. Click here to login. 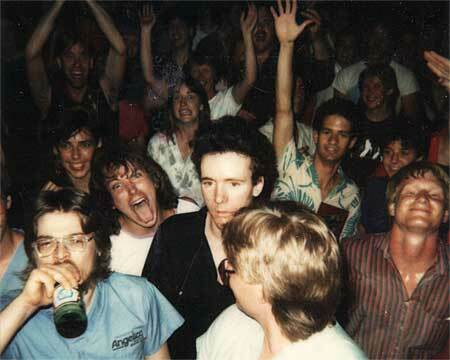 Brian Horton (of Passion B and Blue Hand) in crowd at Scorgies. Photo taken from the stage by Paul Dodd. In the mid seventies, major label acts were either too commercial or too progressive. FM radio, that had started in such an underground promising manner, was overrun with DJs on the payola train. It was fertile ground for bands that began writing and performing their own material. Scorgies was the premiere rock and roll club in Rochester, New York between 1977 and 1987. Original bands from all over upstate New York played here as well as national acts like Marianne Faithfull, John Cale, MX-80 Sound, Mutabaruka, The Cramps, Ramones, The Go Gos, Johnny Thunders, Gun Club, Comateens, Alex Chilton, Tom Verlaine, Willie Loco Alexander, X, Mission of Burma, Fear, and 10,000 Maniacs. Please join this effort to celebrate Scorgies. If your band played Scorgies, send us a link to your site and we’ll include it here. Send us your Scorgies stories. Thanks for the great photo of Brian Horton, some of the great bands that he played in that graced the Scorgies Stage were Passion B, and Blue Hand. That is such a strange picture. He looks so completely outside of what is going on around him- just caught an accident of attention I guess. He may have been considering his immediate avenues of escape from the guy behind his right shoulder. Or it could have been the drugs…. WOW…The ex-manager of the original Chesterfield Kings (Jim Havalack of Quality Trans. Limo Service) told me about this site. I have a lot of memories of the place since New Math, The Fugitives, and The Insiders were my weekly dancing and rockin’ partyin’ habit. I used to video tape bands on beta tapes until Armand Schaubroeck warned me not to do so when the C-Kings were getting too big for the place. I went there before and after it became a Yuk-Yuks comedy club. My fave bands were The Ramones, Bangles, Insect Surfers, Tav Falco’s Panther Burns (well, actually the bands that opened for them). A few Mike Murray (of Whole Lotta Shakin radio) bands played there as well. Can’t forget even Cousin Al & The Relatives. My friend, Jon Pirincci, now a comedy actor in LA used to manage The Press Tones. I’ll add more…if I remember anything other than peeing next to the building in the cold of winter!! A couple other bands that played Scorgie’s later on were The Projectiles and The Fadeaways. The Projectiles evolved into The Riviera Playboys, Del Rivers & The Electric Cowboys (sort of; not a real band!! ), Thee Ummm (in Albany, NY), and a couple bands run by guitarist Dan Frank (see his MySpace). The Fadeaways remain intact as The Los Fadeaways (like The Los Straightjackets). I used to introduce them and other bands when I was a d-j on Whole Lotta Shakin. That evolved into some stand-up comedy. Nothing was worse than my horrible JFK imitation, but it was all fun. As for Brian Horton, I knew him later on. He used to drive like a maniac over sidewalks and dividers, while I rattled around in the back of his truck like a clapper in a bell. Best songwriter that Rochester ever produced. I used to have a crush on the girl in the left of the picture above!! Is that girl (the one on the left) one of the kimono sisters? In lieu of Del’s current presence I’ll answer that yes, that is indeed Kimono Andi Koller. memories permanent in our mind’s eye. Sigh…. It’s Jason Brown next to Brian if you’re keeping score. And it looks like Beth Doer behind Jason and Andi…. Drop me a line Rich! Anyone have any info about Buffalo’s New Toys who played here? Remember Meat Cleaver and Rocky Starr!!?? They had one 45 single as far as I know…it was a wider sleeve than my 45 box; definitely homemade stuff! We need more comments about Scorgie’s – not just the picture above!! Del I was gonna write the same thing yesterday! You forgot Rocky’s brother Kevin Rat!!! They were the Toys and had to change to the New Toys. They also released 1 LP as far as I know! Toys best song- “Self Abuse”. I thought they were great. The two brothers in the band moved to NYC and still played music for the last 25 years and I may be mistaken but I think one of them may have passed away. I hope I’m wrong. Next up- Stories about Toronto’s own, The Forgotten Rebels. They’re STILL great. Is that Chris Shepp behind Brian? Well, damn, that IS Bernie back there . . . I don’t remember Beth Doer – it does also look like Tracy Schmitt, the other kimono girl. And the Toys from Buffalo were one of my favorite Buffalo band. That Self Abuse song was a hoot. Rocky Starr of The Toys (and the New Toys) did indeed die back in 1996. I knew that I had researched that a few years ago and was saddened to read that. I was the guy who told the U of R Delroy Rebop wouldn’t go on withot you. Another Buffalo band from early on was The Vores. Their single was Love Canal. They had Mosrite guitars which looked awesome but didn’t sound too good. Hey Barry! Great to hear from you! Any Delroy Rebop photos you can post? Sorry no video of Delroy Rebop! Maybe Lynn or Mary (the light girls) may have something! Yes. I am keeping score, Simon. The score is Cliches 50, Presstones, 0. Heh heh. Do you know how to reach Lynn or Mary to ask? Hey Jason, GREAT pic of you next to Brian. At first I thought it was Kip Winger!! I thought it was Gene Simmons without his makeup on! Jason Alive! I’m surprised no one has noticed, but the guy with his arm way up in the air is George Greven from Slightly Psychedelic. Now question- Is that Jim Huie in the front row looking over his own right shoulder? that is not me in the picture, but thanks for the shout out, Craig! i am thrilled that Simon doesn’t remember me. is the blonde guy richie hollins? Nope, not me in the blonde hair. Looks more like my brother Chris. But I doubt he would have been stage front. Is Beanie the same person as Beth? If it is, HI BEANIE!!!! hi to you Ritchie or should I say Smitchie & every one else!! Great fun to read all this…. Kip Winger is taller and probably earns more money than I do, whatever it is he does for his kippers these days. By the way, the keys to the monkey’s mouth are still missing . . .
Chris Schepp’s name has come up several times. Does anyone know why he always called me Mary Ann? Every time I saw him he’d squint at me and say, “Hiiii Maaaryyyy Aaannn…” Like, was there a Ginger somewhere? I do remember you, Beth. Just responded too quickly without thinking. Story of my life. And C. Laben spelled your name wrong. Yes, the key is in the monkey’s mouth…with the wood-stock! give me a call man, we have got to catch up! I will not be able to make Rochester Friday, I would if I could but my schedule doesn’t allow it this time around.